EcoGIS is plattform to monitor energy consumption and CO2 emissions, realised with the contribution of the European Fond for Regional Development (EFRE) 2007-2013* and licensed under the AGPLv3. The WebGIS Application allows to manage all CO2-Emissions of a municipality, to define actions to reduce the carbon footprint. These actions can then be combined to different szenarios, which are compared to each other in order to find the most effective Sustainable Energy Action Plan (SEAP). EcoGIS allows to compare the szenarios not only in terms of effect on the emissions, but also from a economic point of view, or on their effect on the energy mix of the municipality. * EcoGIS has been included among the "Winning Projects" funded by the 2007-2013 ERDF program, as an example of best practice. With EcoGIS you can monitor all sources of CO2-emissions, but also test different szenarios and evaluate their effect on the carbon footprint. The data can be displayed in histograms or thematic maps. EcoGIS has a user friendly web interface, accessible to all registered users. 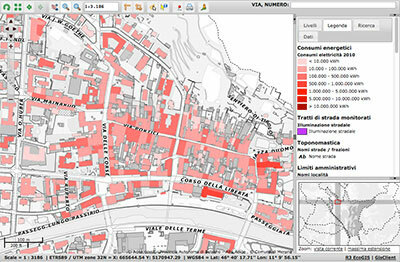 The WebGIS is simple and user friendly and allows to analyse all data based on the position. In order to calculte the carbon footprint of a city it is sufficient to enter all energy consumption data. 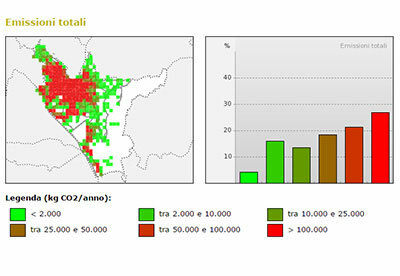 EcoGIS converts the data to CO2 emissions and allows the export of all tables required by the covenant of mayors. and . The map interface allows to georeference enegy consumption, CO2 emissions and actions, connecting them to buildings, streets, districts in the map. The information can also be displayed on thematic interactive maps. EcoGIS has a particularly detailed data form for public buildings, describing all construction and energy characteristics. In addition there are less detailed forms on residential buildings, offices, industry, traffic and public lightning. The recorded energy consumption is converted automatically into CO2, and TPE (Ton petroleum equivalent). EcoGIS has also a website to communicate the main data to the public. In the initial phase of the project will proceed to the identification of the energy consumption of a territory and as a result of its emissions. This initial assessment might have different levels of detail depending on the data available. In any case, consumption (and therefore emissions) directly influenced by the city, such as public buildings, street lighting, municipal vehicles, can be surveyed with a higher level of detail. All data can be associated with positions on a map. The next step involves the identification of possible action at the municipal level for energy saving and emission reduction. For each intervention the effect in terms of environmental, energy and financial aspects is assessed. Furthermore action can be geo-referenced in the territory. Through a simulation tool different scenarios can be compared in order to define the SEAP. 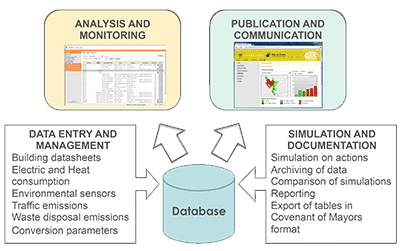 All data collected, related to fuel consumption, emissions and interventions are managed in a single spatial database, through a simple and intuitive web interface. Through the map interface you can see and query the data. EcoGIS allows you to export the information to Excel tables according to the specifications of the Covenant of Mayors. 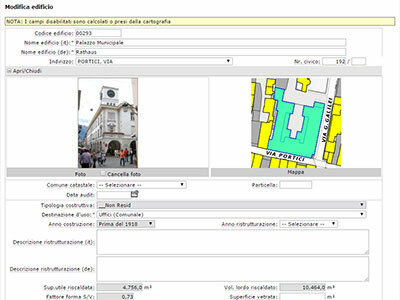 Through the portal you can search public buildings that meet certain characteristics, or color the individual buildings so that they represent, in a scale from green to red, the level of consumption of the electrical or thermal energy, as well as make available to citizens the data collected and tools to analyze them (Open Data). EcoGIS also allows you to record each year the level of achievement of individual actions under the SEAP. Summary reports thus enable to document progress. You can also repeat the consumption and emissions baseline regularly to assess the effect of the SEAP implementation. EcoGIS allows you to manage also groups of municipalities. In this case each municipality can access its own data, but the coordinating Agency can access all the data and have an overview. This mode is particularly interesting for provinces or groups of municipalities, as it ensures that all the data of participating municipalities flow together on a single centralized platform. The Covenant of Mayors is a European cooperation movement involving local and regional authorities. 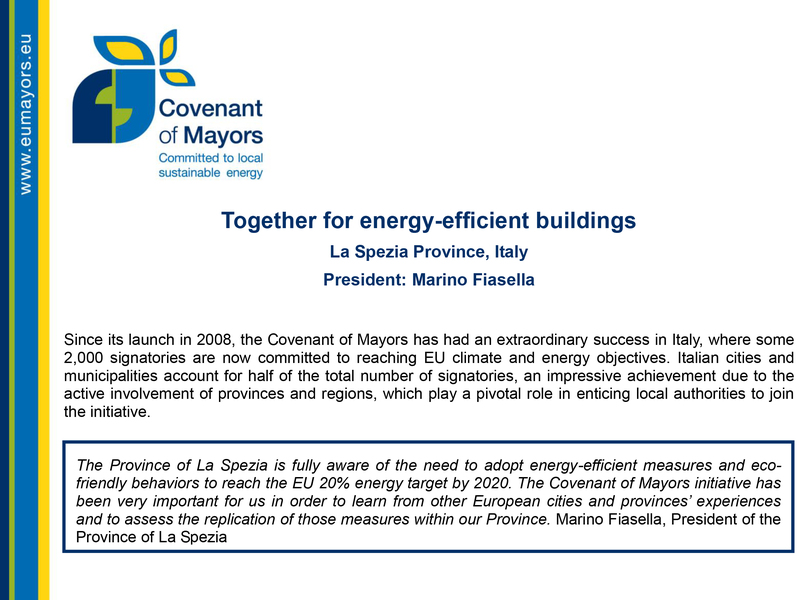 Signatories of the Covenant of Mayors voluntarily commit to increasing energy efficiency and the use of renewable energy sources on their territories. By their commitment, they support the European Union 20% CO2 reduction objective to be reached by 2020. To date about 6600 municipalities participate to the Covenant of Mayors Initiative. Mayors Adapt – the Covenant of Mayors Initiative on Climate Change Adaptation has been set up by the European Commission to engage cities in taking action to adapt to climate change. Cities signing up to the initiative commit to contributing to the overall aim of the EU Adaptation Strategy by developing a comprehensive local adaptation strategy or integrating adaptation to climate change into relevant existing plans. EcoGIS is gearing up to handle even information going beyond the census and monitoring of emissions, to meet the needs of the initiative Mayors Adapt. 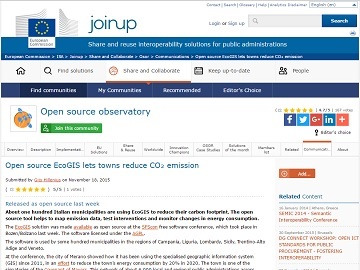 Article published on the Join Up, the portal of the European Commission about "share and reuse interoperability solutions for public administrations". The Province of La Spezia on 6. October 2009 has been recognized by the European Union as local support structure of the Covenant of Mayors. To give support to the municipalities participating in the preparation of the Action Plan, the Province has chosen the application WebGIS EcoGIS. 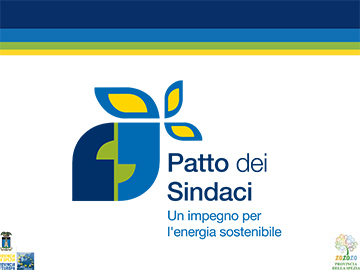 Report of 2012 on the project SEAP of the Province of La Spezia. Realised with the contribution of the European Fond for Regional Development (EFRE) 2007-2013.